Although Europe is catching up with the likes of Sweden Rock and the classic rock day this year at Download, the classic rock festival circuit is best established in the United States, where I have travelled most summers for the past decade. This year was my first trip to Moondance Jam, one of the mid-west's premier music festivals, now in its 18th year, in rural Northern Minnesota. Unlike other festivals such as Rock Fest in neighbouring Wisconsin, Moondance has stuck to a classic rock diet rather than chase a younger crowd with rising contemporary acts. However, partly because of the recession, the festival was cut this year from four days to three. Yet I still had an early opportunity to check the scene as a pre-show party took place the night before in the Saloon Bar, a covered shed that doubles as a side stage, which was packed to the rafters. Four covers acts were highly impressive, including Skynyrd tribute act Freebird, veteran locals Mountain Ash and Hairball, who pay tribute to the eighties hair metal scene with a pair of singers creating uncanny pastiches of the likes of Dee Snider and Paul Stanley. Incidentally, the Saloon continued to host bands in between the main stage action all weekend, and I was particularly taken with the Bad Animals, a Heart tribute band that carried off the magic of the Wilson sisters both visually and musically. Moondance is a perfectly sized festival, around 15,000 being present each day- large enough to attract a strong roster of bands, but small enough for an intimate, almost family atmosphere - indeed owner and promoter Bill Bieloh could be seen around the grounds mingling with fans all weekend. The major talking point on the first day was the unseasonable weather - the mercury failed to even hit 60 degrees, and the wind swept in behind the exposed stage, with many of the bands wearing hastily procured sweatshirts. Nevertheless the music was exceptionally strong, beginning with the local band slot being filled by SHOOTING STAR, the Kansas City pomp rockers led by founder member Van McLain, and a band I've been into for over 20 years without ever seeing. They are very much in a Kansas mould, with a new singer in Ronnie Platt following Kevin Chalfant's departure, and violinist Janet Jameson whipping up a storm and compensating for the odd absence of a bass player. Their set was a mixture of old and new songs, most of which the crowd was unfamiliar with, but a smattering of people around me got into set closers Breakout, Hang On for Your Life and the pomptastic Last Chance, the latter two featuring great violin guitar duels. They seemed to win some new friends and I would love to see them come to the UK to do a festival such as Firefest. Another band that never cross the pond, despite being originally British, FOGHAT were next up and their bluesy boogie, underpinned by founder member and drummer Roger Earl, got the crowd going. Replacement singer Charlie Huhn ably filled the void left by the late 'Lonesome Dave' Peverett, but the man of the match was Bryan Bassett with layer upon layer of slide guitar on the likes of My Baby and Drivin Wheel. The poppy Third Time Lucky was the surprise of the set, Chateau Laffitte 59 boogie broke into a seemingly endless jam, and the closing trio of Fool for the City, I Just Wanna Make Love To You and Slow Ride gave the freezing crowd all they wanted to hear. KANSAS were for me the best musicians all weekend, and possibly my favourite band. Mainly focusing on their more progressive early years , some of the ensemble playing between Steve Walsh's keyboards, Richard Williams' guitar and livewire violinist David Rasgdale was quite breathtaking on songs such as Miracles Out of Nowhere, Icarus and Down that Road. Despite looking bizarre in his waist length thinning hair and black shirt and tie, Walsh also seemed happier in himself and closer to his vocal best than when I previously saw them, and he was ably backed by bassist Billy Greer who also acts as a the compere. Highlights included Dust in the Wind, with keyboard and violin solos of haunting subtlety, and Portrait. I was pleasantly surprised they played Fight Fire with Fire from their more commercial 80's period, although it didn't really suit the current line-up, before closing a superb set with the inevitable Carry On Wayward Son. SHERYL CROW was arguably somewhat out of place at the festival and on a hiding to nothing but despite shivering in a coat and scarf, she played a blinder, working the crowd well and blending a generous helping of her hits - Everyday is a Winding Road, If it Makes you Happy,etc - with some rockier numbers including covers of Black Betty and Rock n Roll. Even though Soak Up the Sun and All I Wanna Do sounded inappropriate for a cold, windy evening, I was sufficiently pleasantly surprised to pick up her Best Of CD later in the holiday. The place was now packed for JOURNEY, and interestingly their appeal really seemed to span the generations as many of the people down the front can not even have been born in their early 80's heyday. After being restricted to 40 minutes at Download, I was eagerly anticipating their set, only for Separate Ways to prove a false start with sound problems notably affecting Deen Castronovo's drum sound, thankfully sorted within a couple of songs. The kings of AOR delivered a definitive set, mixing the 'dirty dozen' of their big hits with four new numbers from Revelation and the odd surprise - One More from the 1996 Trial by Fire reunion, and Be Good to Yourself made it back into the set. Neal Schon was superb as usual, while Arnel Pineda was a bundle of energy and has given them a new dimension, although his spoken English between songs was almost unintelligible! Few bands can knock out a closing trio of the quality of Faithfully, Don't Stop Believin' and Any Way You Want it, but with Ross Valory ostentatiously pointing to his watch, there was still time for an encore of Lovin' Touchin' Squeezin' to finish an hour and 50 minute marathon. Fortified by a soak in the hotel jacuzzi and a lunchtime steak, I was back at a still chilly grounds for 3pm the next day. Proceedings were opened by a very impressive tribute band ZED LEPPELIN who also resembled Led Zep visually and concentrated on material up to Led Zep IV. Indeed the festival confirmed my hunch that the professionalism and attention to detail of American tribute and cover bands is way ahead of ours. 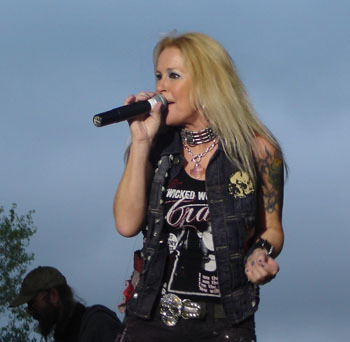 I sat out the SPIN DOCTORS so the next interest in me was seeing LITA FORD for the first time since supporting Bon Jovi over 20 years ago. Her break from music to raise a family on a remote island seemed to have done her good, as not only did she still look great but was a confident performer whose sense of enjoyment transmitted itself to the crowd. 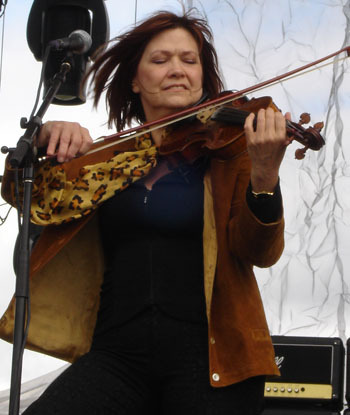 Well supported by her band including Bumblefoot from Guns n Roses, with whom she enjoyed several guitar duels, she romped through oldies such as Larger than Life, Goota Let Go, Back to the Cave and Hungry, but the two new songs, on which man-mountain husband Jim Gillette duetted, were a jarring contrast, bordering on nu-metal. She donned a double neck for ballad Close my Eyes Forever, before Kiss Me Deadly unsurprisingly ended the set and there was a party atmosphere down the front. I went away hugely impressed, adding her to my wish list for future shows in the UK. 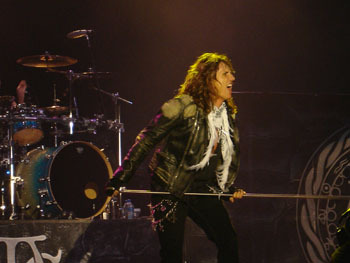 The rest of Friday was a stop on the WHITESNAKE and JUDAS PRIEST USA summer tour. My expectations were low for Whitesnake after disappointing at Download and at Wembley last year, but David Coverdale seemed in better form though still screeching too much for my tastes. The set was also tailored to songs that an American audience would know, (no 'Aint no Love'), together with newies Best Years and Lay Down Your Love, on which Doug Aldrich and Reb Beach got into a heavy groove. However after Love Ain't no Stranger and Slow an Easy, too much momentum was lost with endless solo slots that surely have no place in a set of only an hour and ten minutes. Nevertheless the closing trio of Give Me All Your Love, Here I Go Again and Still of the Night were rapturously received and on balance I enjoyed the set. Priest are playing the whole of the 1980 classic 'British Steel' on tour, and opened with this segment. Of course Breaking the Law and Living after Midnight remain two irresistible anthems that stand out, but this was a welcome and rare opportunity to hear some of the more obscure tracks live - highlights being the huge riffing of The Rage, and Steeler with a great solo from KK Downing (the lead guitar breaks seemed more evenly distributed between him and Glenn Tipton than I'd remembered previously). 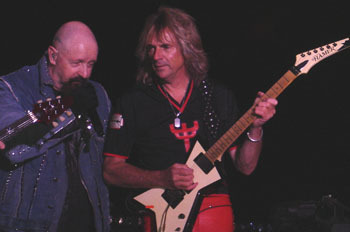 There was time for four more songs old and new, including a cracking The Ripper and Victim of Changes, inexplicably omitted from the last UK tour, as vintage as ever with the twin guitar intro, Rob Halford's screams and solos from both guitarists. Priest also freshened up the encores- Halford arrived as per usual astride his Harley but to play Freewheel Burning, followed by an electrified Diamonds and Rust, before he had the crowd in his hand with some call and response leading into You've Got Another Thing Coming. Though the set weighed in at short of an hour and a half, Priest had been on fine form and it was vastly superior to their slighty disappointing UK tour. Sadly the final day was a bit of an anti-climax after the excellence of the first two days. It did not help that Thin Lizzy imploded only a fortnight before the festival,; a tribute band OZZMOSIS, with an uncanny 'Ozzy Osbourne', opened up instead with all-girl AC/DC tribute THUNDERSTRUCK moved up the order. With Englishwoman Tina Wood a convincing Angus both in guitar style, dress and duck walk, and singer Dyna Shirasharki moving between Bon Scott and Brian Johnson songs and donning a flat cap for the latter, they went down a storm and indeed the familiar material meant the crowd seemed to get into them more than some of the original acts. 70'S legends GRAND FUNK RAILROAD were next up, now something of a supergroup with original rhythm section Don Brewer and Mel Schacher joined by ex-38 Special singer Max Carl (who was allowed to sing Second Chance from those days) and ex-Kiss guitarist Brice Kulick. They got into a solid groove with some of their more pop and soul influenced rockers such as Rock n Roll Soul, Footstompin Music and the Locomotion, but Carl's vocals didnt seem to carry fully, then far too much time was lost with drum solos before Some Kind of Wonderful and a ten minute I'm your Captain picked up the momentum again. 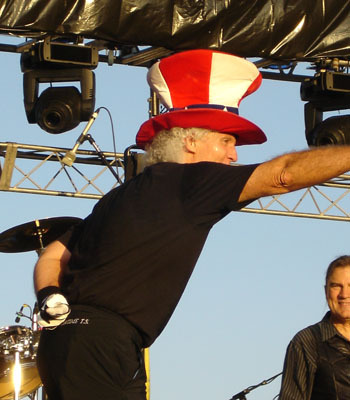 For the encore, Brewer, who remains a larger than life character, whipped up the crowd in an Uncle Sam hat before helping to sing their classic We're an American Band. If Grand Funk had produced a mixed bag of a set, then ASIA were by far the biggest disappointment, with John Wetton and Steve Howe in particular looking bored and disinterested. Wildest Dreams and Only Time Will Tell got the set off to a reasonable start, but they failed to hold people's attention and when the Smile Has Left Your Eyes and Don't Cry were played acoustically, they were drowned out by the sound of chatter from the crowd. Only on Fanfare for the Common Man (and the balance of the set was too heavily weighted towards songs by their old bands, with just a solitary new song) did the band really show any vitality. Heat of the Moment should have been a crowning glory, but the band seemed all over the place, and people only really responded when Geoff Downes came down to the front with his 'keytar'. As a big fan I was hugely disappointed but it was actually a relief when they finished after only 55 minutes. 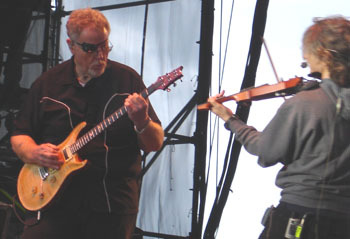 The festival was closed by YES, as part of their double bill with Asia. Steve Howe was back and looking rather more engaged, while new singer Benoit David was doing a decent job of replacing Jon Anderson, but I admit to never havng got into their grandiose prog and called it a night after two lengthy opening songs. Nevertheless this was a thoroughly enjoyable festival with a relaxed friendly atmosphere, well organised, and with some memorable performances including bands who rarely if ever play the UK. 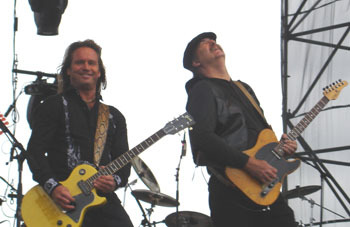 I will certainly be reviewing their website www.moondancejam.com with a view to being tempted back in future years.